Be the first to share your favorite memory, photo or story of Vidella "Sue". This memorial page is dedicated for family, friends and future generations to celebrate the life of their loved one. 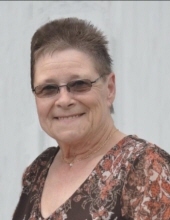 Vidella “Sue” M. Parker, 69, of Tomah, WI, passed away Friday, March 29, 2019, at Mayo Clinic Health System in Sparta. Sue was born June 30, 1949, to Charles and Petra (Peterson) Parker. Sue spent her life living in the Tomah area where she enjoyed working with in the food service industry. She had a wonderful knack for gardening and keeping her yard looking nice and loved being outdoors with her special dog, Kesha. Sue was very proud of her children and grandchildren. She enjoyed every opportunity to be with them. Sue is survived by three children, Tina (Jeff Nikolaus) of Mansfield of Ohio, Theresa O’Neil (David Nikolaus) of Sparta, and Tracy Parker of Tomah; three siblings, Beverly Kulikowski of Sparta, Charles (Faye) Parker of Sparta and Phillip (Rose) Parker of South Bend, Indiana; 10 grandchildren, Taylor (Ian) Prince, Jacob Nikolaus, Mackenzie Nikolaus, Megan (Jason) Lauritzen, Kyle (Mykala) Isensee, Tanner O’Neil, Carson O’Neil, Emma O’Neil, Viktoriah Rodriguez, and Lillianah Tejeda; four great-grandchildren, Gage, Logan, Saphira, and Duke; along with many nieces, nephews, other relatives and friends. Sue was preceded in death by her parents, Charles and Petra Parker. and her sister Virginia. Funeral Ser vices will be held Tuesday, April 2, 2019, 6:00 P.M. at Torkelson Funeral Home in Tomah, WI. Pastor Bob Streeter will officiate. Family and friends are invited for visitation on Tuesday from 3:00 p.m. to 6:00 p.m. at the funeral home. "Email Address" would like to share the life celebration of Vidella "Sue" M. Parker. Click on the "link" to go to share a favorite memory or leave a condolence message for the family.